The term “hypoallergenic” means that a product causes little to no allergic affects. Although the term is not relevant in the medical industry due to unset standards, it is commonly used by people and businesses worldwide to describe their products or even in some cases, pets for sale. Anything that produces less allergen may be considered as hypoallergenic. Anyone with severe allergies, asthma, other respiratory issues, or even sensitive skin might find that certain products cause them allergic flare ups. This is potentially dangerous in some circumstances. That’s why many commercial brands have coined the term hypoallergenic due to the lesser allergy risks involved with their product. What Does Hypoallergenic Mean In Terms of Disposable Gloves? For professionals constantly using disposable gloves in their field, the harsh proteins in latex gloves often cause allergic reactions. Some of these reactions may show up as itchy skin, rashes, difficulty breathing, and other similar affects. Not only may latex cause a reaction to those allergic, but over prolonged use, allergies may form. The proteins in the latex disposable gloves may not be the only thing that causes allergies to those with sensitivities but the powder on the gloves may also irritate the skin. The powder that you find on disposable gloves is there to help make them easier to put on and take off. However, powder-free gloves are available. For industries or individuals looking for hypoallergenic disposable gloves, consider gloves made with the material nitrile. Nitrile is a synthetic rubber blend without harsh proteins. The materials are gentler on the hands and actually have some amazing benefits. In fact, nitrile disposable gloves are 3 to 5x more puncture resistant. Over the years, the design of nitrile disposable gloves only gets enhances, making them more favorable. 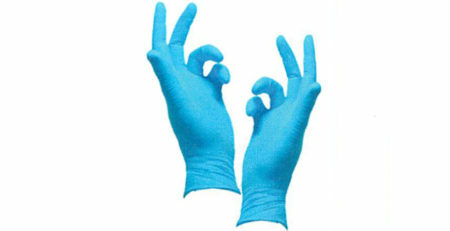 Nitrile gloves provide nearly the same comfort and flexibility as latex disposable gloves. They come with a textured surface for firmer grip and the glove conforms to your hand with body heat. They come in a variety of styles and sizes, including powder-free versions. Although it isn’t proven that nitrile cause no allergies, it is a wonderful alternative to latex and is considered hypoallergenic due to the lower risk factors and materials that are little known to cause allergic reactions.